From a very early age, I learned to not ask for money. At 4 years old, I immigrated to the US with my brothers and dad. For four years, my dad was the family’s sole provider – paying for our basic needs while sending extra money back home support a family member. My dad could have afforded a more extravagant lifestyle, but with his upbringing in an economically unstable country, sending money back home, and starting from scratch with almost no retirement savings, I was often told that we couldn’t afford things. I was taught that much of what I wanted was truly a want and not a need. As a girl, I wore my brothers’ hand me downs. Our first pieces of furniture were moving boxes. Our first Christmas ornaments were my dad’s cigarette boxes decorated in wrapping paper. In a few years, we gained a step-mom and the family member we supported back home passed away. With more financial stability, I started getting “wants”. I don’t remember having anything new until about middle school and even then, that was rare. Mom started buying clothes from big chain stores and we had cable television. After hearing for years that “we had no money,” if I received money as a gift I would hoard it. About 15 years after coming to the US, my dad was able to retire via extreme saving and a well-paying job. He reached FI in 15 years having started at age 45 while paying the mortgage as well as supporting others. Respect. The greatest money lessons I learned from my parents were debt aversion, frugality, and saving. With these lessons, I was able to pay for a trip to visit my home country at age 21 with cash and eliminate my $81,000 in student loans in 3 years after obtaining my degree. Upon high school graduation, I had no clue what I wanted to do. To my parents, education was important and so I was forced to go to a close-by junior college, which ultimately shaved thousands off my college education. (Side note: a junior college is different from a community college. Once you have a general associate’s degree from the junior college, more of your credits transfer to a 4-year school than a regular community college would. Junior colleges are designed to get you directly into a 4-year school and do not offer certificates or vocational skills.) I also had knee surgery from a sports injury around the time I was set to graduate high school. Although unfortunate, I found my silver lining and choose physical therapy as my career. Without meaning to, I designed a lifestyle that catered to my two interests: travel and physical therapy when I became a traveling/contract PT. Not only do I get paid to go to work in new locations, but I also have the flexibility to take time off between work assignments and travel at my leisure. I couldn’t ask for anything more. Another lifestyle design I unwittingly accomplished was keeping my possessions to a minimum. My work allows me to change locations every 13 weeks and I refused to pay for a storage unit. That’s where minimalism came into play. When I left my parent’s home, I owned two Prius-loads of things. With each move, I’ve slowly whittled down my belongings to ¾ Prius load. I use my car to drive to work and as a moving van. Not having much to pack makes the moving process easier. In PT school, I had rotations and my first rotation was at a nursing home. Some residents in these homes are not able to take care of themselves for various medical reasons. Others were not able to pay for lodging in their older age, but were able to afford the nursing home through Medicaid. I most certainly did not want this to be me. The quality of life I observed at this particular nursing home was not what I wanted for myself. This sparked my desire to learn how to handle money and control my future. That’s how I eventually came across Mr. Money Mustache (MMM) about 18 months after graduating. At this point in my life, I understood how to get rid of debt and save money, but had no clue what to do with that money other than put it into a CD. Once I read “The Shockingly Simple Math Behind Early Retirement”, I expedited my student loan payments and crushed them. My next goal was to reach FI as quickly as possible. I was mentally on FIRE. Shortly after paying off my student loans, I became exposed to the idea of leveraging debt to reach FI earlier. Yes, please! I was seduced by the idea of active real estate investing and paid a large sum for a real estate course before learning that I could have gotten the same information for free online. Within 6 months, I learned that my personality does not lend itself well to active real estate investing in the way that I had learned from this course. I still gained lessons that I plan to implement when I decide to return to real estate in the future, but in a more passive capacity. I’ve heard this described as “failing forward” and I think it accurately describes learning from mistakes. As of 2019, I am debt free, again, and about 20% towards my FI number. I’ve learned that blazing towards FI with intense heat increases the chance of the flame burning out. Slowly, I’m learning that the journey is just as important as reaching the destination. I have even rejected work assignments that I think will make me miserable. Power and freedom are the two sweetest results of knowledge and FU money. There are so many things that are positive and have a great deal of success in your story! While the real estate course may have cost you it sounds like a few valuable lessons were learned, so I agree with the “fail forward”. Personally, we are working more towards a lifestyle design through financial freedom which will become financial independence. If you ever want to bounce ideas, plans, etc. about FI shoot me an email! Cheers to your journey ahead! 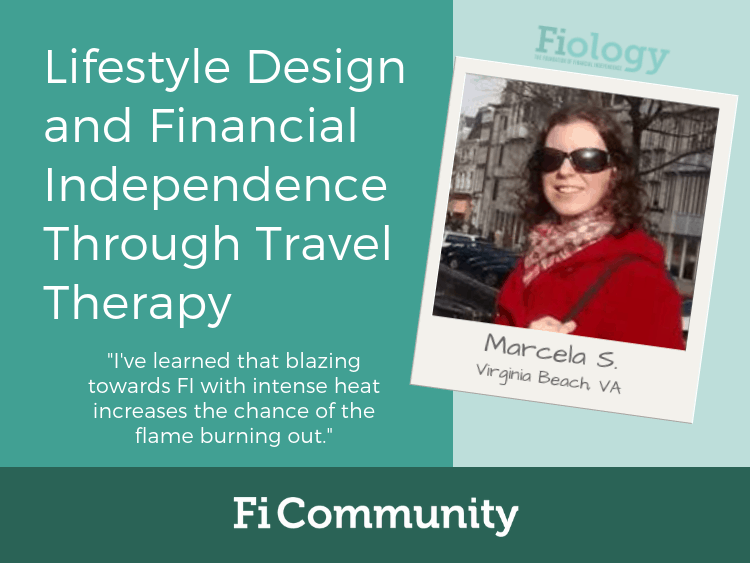 I’m glad to hear that you’re working towards a lifestyle design through financial freedom. Are you able to clarify though? To me, financial freedom is the same as financial independence but I feel like to you, they’re not the same. Just adopting this mindset and building a lifestyle around your core values is such a superpower. It’s great to hear that you are taking action and well on your way to financial independence. Keep crushing it and thanks for sharing your story! Great job, Marcela. I am a PT also and doing travel PT allowed me to be on my farm six months a year. Have you ever worked in South Texas? There is a huge need and you could cut out the middle man and contract yourself. I did it for almost two years and was able to save so much more money. I can give you names of places if you shoot me an email. You can find me at http://www.abovethecloudsretreats.com. I sent you a message! You are awesome! Loved this story because it reminds me of some of my story. Being raised on a slim income really teaches Frugality and knowing what’s a want vs a need and having control of your spending makes your FI journey much more resilient. That coupled with increasing your income is the ultimate combo. I wouldn’t stress about the speed of getting there though because you have a career that let’s you live the life you want at any time. So figure out what you want FI to look like and start practicing that life now! Real estate is not for everybody. Good thing you figured it out before you got super deep into it like me! Keep looking into real estate – there are all sorts of options that don’t have you answering to tenants at all hours. Thank you! I’m not interested in answering tenant calls late at night. My RE course was heavy on flipping and wholesaling. That’s a lot of work that really wears me out. I’m really considering using a property management company when it comes time for me to return to RE. That’s not for a few years. Plenty of time to learn more. Marcela, your story is very inspiring. I love that you were exposed to the nursing home situation at the beginning of your career and used it to multiply to your existing money skills from growing up. Enjoy your travels helping others, while you help yourself to a great life. I love how you said the journey is just as important as reaching the destination and I couldn’t agree more! I would maybe argue that the journey is even more important than the destination. So many people are focused on the destination that they don’t enjoy the journey along the way and become less than thrilled after reaching their destination. Your story is inspiring and will help many others. Congrats on becoming debt free and I know you’ll crush the next 80% to FI!